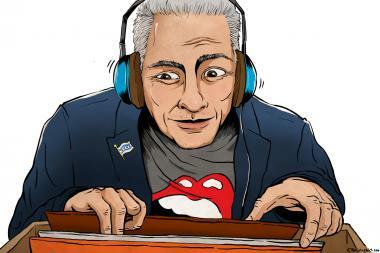 Mayor Rahm Emanuel loves a good rock show and has his favorite music playing constantly in his City Hall office. CHICAGO — Just a heads up to the guys in Delta Spirit: Mayor Rahm Emanuel plans to catch your set at Taste of Chicago Wednesday because I told him your band really rocks. As it turns out, the only thing our mayor likes better than a live rock show is when he gets a tip to see a band he’s never heard before and they really kill it on stage. So, when Rahm told me he was going to see fun. at the Taste, I told him that missing the opening act — Delta Spirit, a rocking band from Brooklyn by way of Austin, Texas — would be his loss. Rahm seemed sincere — and excited. His voice even went up an octave. There’s a lot of perks to being mayor, but free time to keep up on the music scene isn’t one of them, he said. Rahm called to chat about his lifelong love of music and live shows as the Chicago summer concert season heats up. Frankly, it was a conversation the mayor agreed to have as long as music was all we talked about, which was fine by me. Summertime in Chicago is about more than murder and mayhem no matter what the headlines say. Besides, when you ask Rahm about violence or school closings, the guy’s a broken record, anyway. So, with nothing at stake — except opening up his musical tastes to public criticism — the mayor seemed to loosen up a little bit. We debated Ryan Adams' best album. I like, "Demolition." Rahm likes "Gold." We agreed to disagree. Rahm talked about his favorite places to see a show — The Riviera, Aragon Ballroom and The Vic Theater — and how earlier Monday he had just had a discussion about his master plan to turn Uptown into a music venue mecca. The mayor even told me that it’s now an Emanuel family “requirement” that his wife, Chicago's first lady Amy Rule, join him at rock shows. So, does that mean that the mayor, as a younger man, bounced around in mosh pits? "No," Rahm said, intrigued. "Am I missing out?" "It's too late for you," I told him. Rahm said he spent his youth listening to Bob Dylan, Van Morrison, Bruce Springsteen and the Rolling Stones, and that’s probably why he’s drawn to bands with a folk-rock bent. “I grew up with music. I love it, and I haven’t given up my passion for it. … Given my mother’s history always listening to folk music and growing up my age with rock ‘n’ roll,” the mayor said. “Folk-rock is the perfect synthesis of the two." So, it made sense when Rahm rattled off the first of his favorite artists that came to mind: Lucinda Williams, Ryan Adams, The Lumineers, David Gray and Kasey Chambers and a collection of Chicago’s best — Wilco, The Smashing Pumpkins, Andrew Bird and Buddy Guy, among them. Listen to Rahm's City Hall Mix here. Rahm said when he’s working, the songs never stop playing. Not in the car. Not in the office. Chicago’s music-loving mayor governs to the tune of rock. 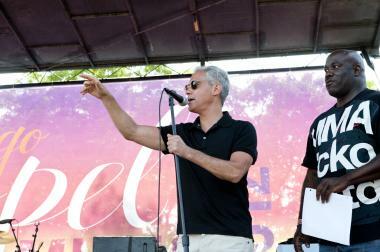 Mayor Rahm Emanuel talks to the crowd at Gospel Fest. The mayor even has his own music guy — a buddy named “Luke” who keeps him stocked with compilation CDs. “I’ve got like 15 of them. I’ve always got one playing. Here’s what’s on Volume 1,” Rahm says before quickly rattling off an eclectic playlist that starts with, get this, Taylor Swift’s hit "I Knew You Were Trouble." It didn’t surprise me when Rahm said he planned the concerts he’s going to see months in advance. Like everything else, the mayor takes his live music experience seriously. In fact, that’s why he skipped out on the Rolling Stones show at the United Center last month. Yes, mayor, it’s OK. It’s OK. This year, Rahm saw Mumford and Sons, David Gray, Ray LaMontagne, Buddy Guy. He caught a few bands at Blues Fest and Gospel Fest, too. Fun. (and Delta Spirit) are next on his list. He's still debating which bands he’ll see at Lollapalooza the first weekend in August. Sometimes, but not often, Rahm hits a rock concert on a whim. It happened back in April. A pal persuaded the mayor to see My Morning Jacket front man Jim James play a solo show at The Vic — and Rahm has been hooked on James’ songs every since. After our chat, I felt pretty confident that Rahm will like Delta Spirit. After all, they caught their big break, coincidentally enough, after touring with My Morning Jacket in 2011. Still, I figure it’s worth asking Matt Vasquez and the Delta Spirit boys to turn it up a notch on Wednesday like they did at Lollapalooza and House of Blues last year. They’re probably my only shot at ever influencing ol’ Rahm, which is fine by me.